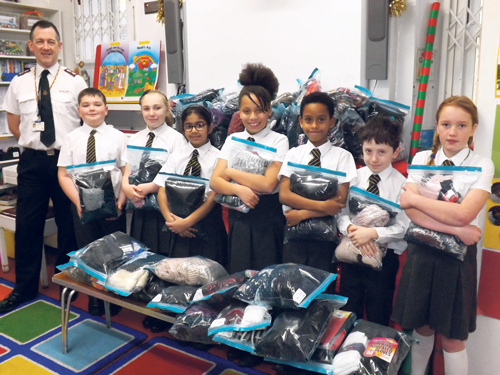 PUPILS from Gracefield School collected HUGS for the homeless in a campaign to provide Hats, Underwear, Gloves and Socks which were distributed via the Salvation Army. The children from the Overndale Road school handed over their bag of HUGS at a special assembly attended by Captain Michael Allen from the Salvation Army. Captain Allen told the children all about the work of the Logos House Salvation Army Lifehouse, a hostel in central Bristol, where the bags were distributed. He explained the plight of the homeless people that they help at Logos House and about one man who cried when he received a hat given to the hostel, saying "Somebody remembered me". Headteacher Elizabeth Morgan said: "We were delighted to be able to help such a worthy cause. "We want our children to become all rounded students and responsible citizenship is something we value at Gracefield School. The children are aware that these small bags of warm clothing will make a real difference to someone’s life."